The Essential Phone is one of the Android handsets that supports the Android P Developer Preview. 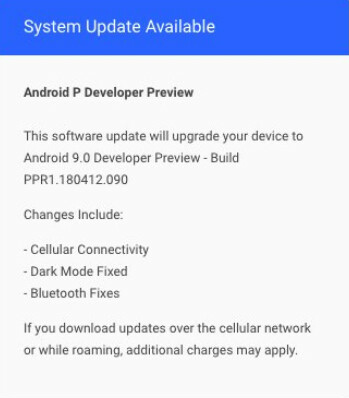 And on Friday, the company announced that it was pushing out an update to the Developer Preview that improves cellular connectivity, and fixes issues with Bluetooth and Dark Mode that popped up after the initial update. The new build is PPR1.180412.090 and is being sent out OTA. The Android P Developer Preview is not meant for the general public. It is unstable and users are likely to encounter many bugs and unfinished features. The update is really for app developers who need to test out how their apps look and respond while running on the new Android build. Essential promises that it will support the PH-1 with Android updates for two years, and will continue to send out Android security patches for three years. While company founder Andy Rubin told employees in an email last week that Essential is not shutting its doors, he left open the possibility that the company will be sold. Essential has been seeking financing and a new smartphone has been cancelled. The next device to come from the company could be a smart speaker. It's sad about the company. Even though the phone came out seemingly half baked, I've seen so many reports of update after update. If only the supposingly high end OEM with Android software updated their devices like this. True. Their frequent updates r very good in Android scene. I hope Essential gets to survive this financial crisis.